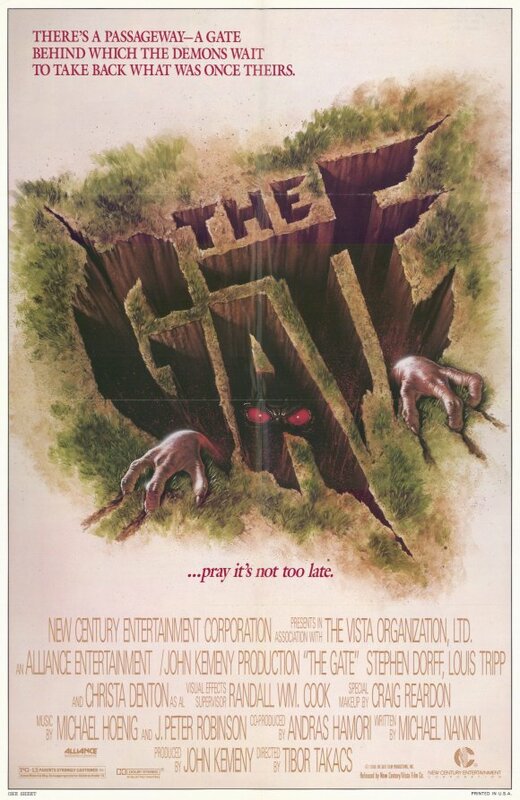 The Gate was a horror film I was able to connect with I was younger. Here's a horror film that revolved a couple of kids, a love for launching rockets and digging holes that opens a gateway to an evil dimension of demons that invade the earth. The story is a classic battle between good and evil as the three kids struggle to destroy a nightmarish hell that is literally taking over the Earth. The film starred a young Stephen Dorf. We accidently summoned demons who used to rule the universe to come and take over the world. This was such an awesomely frightening film, and this is a horror movie I ended up watching over and over again in the movie theater, it was just so much fun to watch. My grandpa took me and my cousin to see this film several times over the summer of 1987 year. I think the fact that this story and the horrific events revolved around a couple kids my own age made the film a bit more real for me, like of this could happen to them, there's more of a possibility it could happen to me as well. That's what made this movie terrifying to me. It was the first time I had seen kids that young being terrorized in a horror film like this. Terry: May the old devils depart! May they burn in the fires of their own damnation! May they freeze in the infinite golden darkness of their own hideous creation! Terry: I guess it's supposed to be. I mean, we're trying to get rid of them. The little demon creatures in the film were pretty cool, but it was some of the other events in the film that creeped me out. There's a creepy levitation seance type scene that really screwed with my mind. It sparked my imagination and made we want to learn more about that kind of stuff. Since then I've always had a fascination with how that stuff all works. Another part of the film that jacked me up was the legend of the construction worked being buried in the walls of the house, and how during the movie that dead construction worker came back to life from within the walls of that house. After that I was always scared as hell about some dead guy busting out of my bedroom wall to kill me. This movie is still fun for me to watch. If you haven't seen it yet you should check it out. It may be cheesy with today's standards, but its still a great creepy old school horror film that can be enjoyable to watch. Unfortunately It's currently in the process of getting a remake. Have you seen The Gate? If so what are your thoughts on the film? Just watching the original trailer below reminds me of how awesome this movie is. The Coen Brothers Planning a Horror Film! ?